As Smilebit Month comes to an end, we crack open one more classic magazine for a look at what gaming journalists thought of a SEGA classic. GameFan magazine was quite a unique publication at the time. From 1992 to 2000, GameFan not only covered general gaming news, but also anime, manga, and featured extensive import coverage. It really was the perfect magazine for gaming fans who were also steeped in anime and importing the latest and greatest RPGs and generally more off the wall titles. 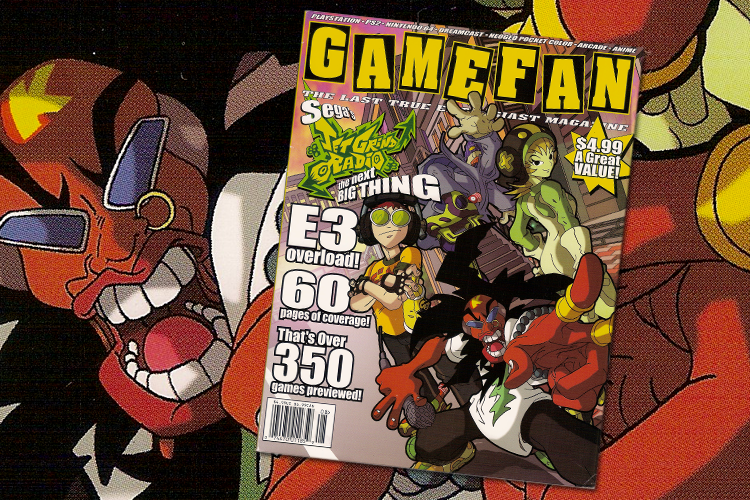 So, of course, it was only fitting that SEGA’s Jet Grind Radio received the GameFan cover treatment for their August 2000 issue and had a four page preview and interview with the then unknown Smilebit team. 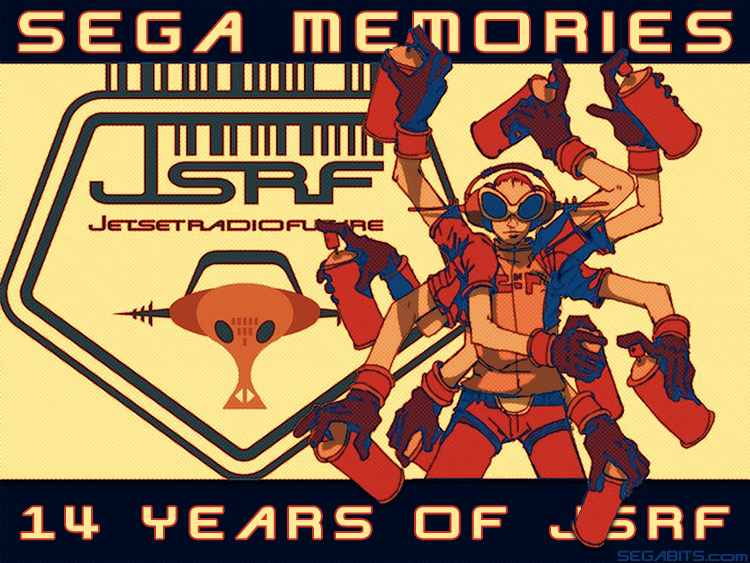 Jet Set Radio and its sequel Jet Set Radio Future are often cited as having some of the best music to come from SEGA thanks in a large part to Hideki Naganuma and Richard Jacques. While in-house talent played a large role in creating such memorable soundtracks, the soundtracks also consisted of licensed music from artists that included Guitar Vader, Cibo Matto, Deavid Soul and others. 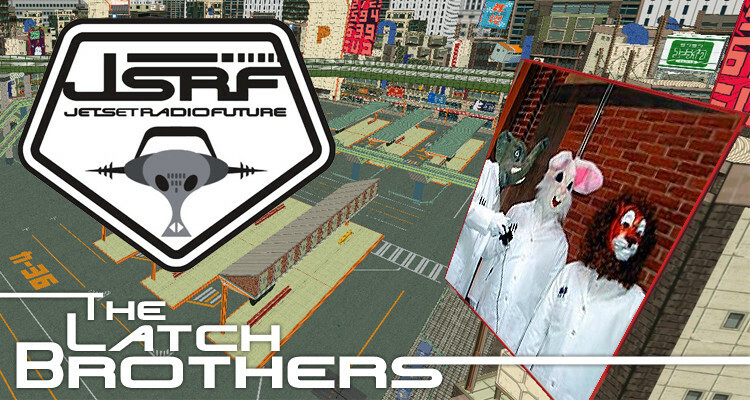 This week on SEGA Tunes (the feature formerly known as Tuesday Tunes) we’re focusing on a third type of Jet Set Radio music contributor: The Latch Brothers. Unless you’re a Sonic The Hedgehog fan, collecting merchandise from SEGA franchises can be a difficult venture. Some games simply have little to no merchandise. Bug!, for example, only has a windup figure from SEGA’s Jack in the Box kid’s meal and a few Saturn era promotional pieces. Ecco the Dolphin and Toejam and Earl merchandise is almost non-existent; the former also had a Jack in the Box kid’s meal toy and the latter is just now getting products thanks to the recently funded Kickstarter campaign. Japanese franchises, like Phantasy Star Online, have quite a lot of collectibles but much of it is Japan only and requires importing and ebay hunting. Other franchises, like Shenmue, have had quite a bit of merchandise in the past and in recent years, but good luck finding any of it for a low price point. Jet Set Radio, meanwhile, has quite a bit to offer fans when it comes to collectibles with several items releasing outside of Japan and many of them being surprisingly affordable. 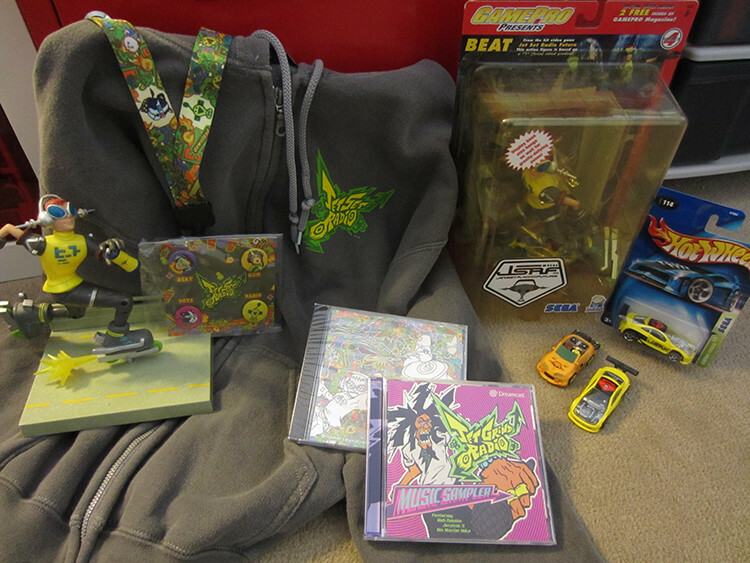 Seeing as Jet Set Radio is one of my favorite franchises, I’ve amassed a small collection over the years which I wanted to show off both because I am incredibly conceited and because I thought it would serve as a nice guide for those wondering what sort of Jet Set Radio merchandise is out there. 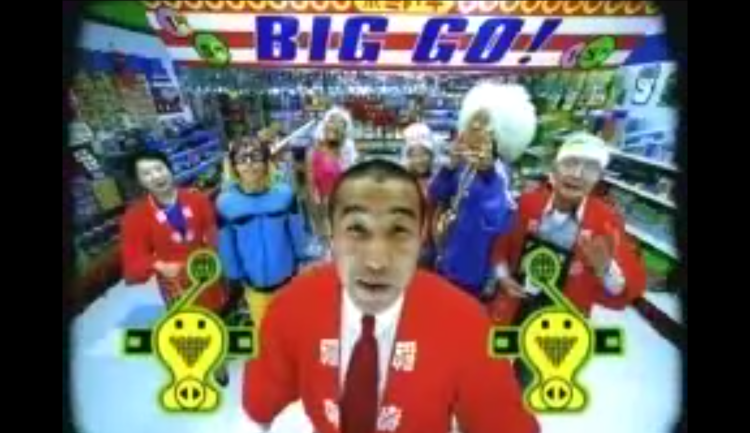 Jet Set Radio had a bit of an identity crisis when it reached the West. 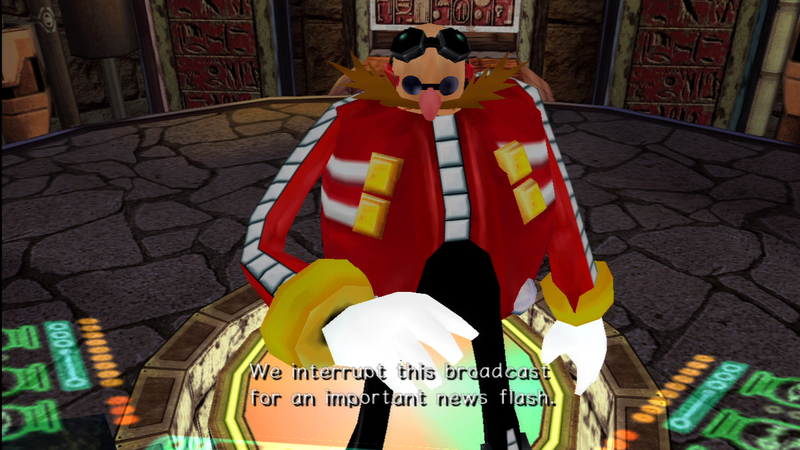 When the game was first revealed in Japan, few media outlets knew exactly what to make of the game. Was it rhythm game? Was it a Japanese take on Tony Hawk Pro Skater? From the teases we got, it appeared to be a bit of both. 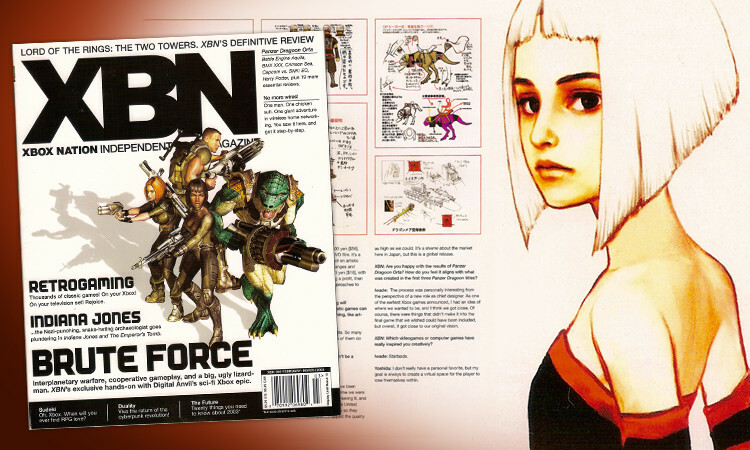 The first real concrete explanation of the game came from America’s Official Dreamcast Magazine, which featured an in-depth interview with Smilebit and a preview of the game. While ODCM did a fantastic job with explaining the game and selling many Dreamcast owners on it, myself included, SEGA of America did a less than fantastic job of letting the general public know what the game was all about. 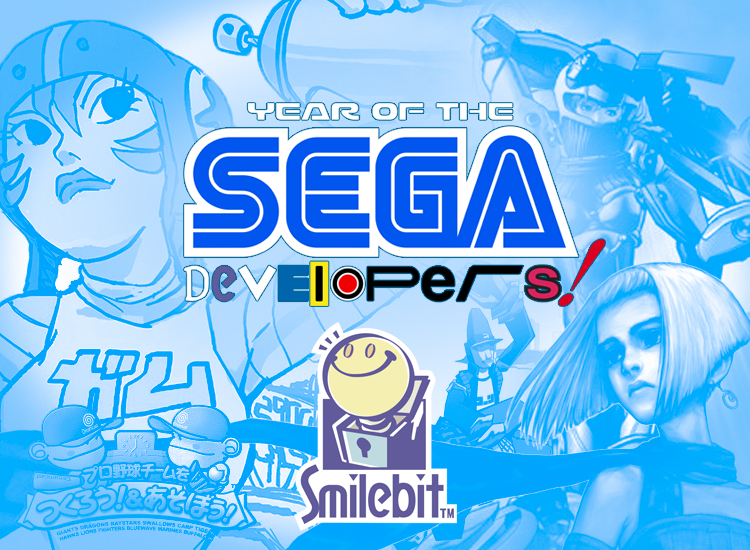 SEGA’s development team Smilebit existed in the public eye for only four short years, yet in that time they managed to create one of the company’s most unique franchises, revived a classic Saturn franchise, contributed to a long running series of popular Japanese sports titles, and managed to create a few new franchises that have gone on to become true hidden gems. It’s fitting that we follow Team Andromeda Month with Smilebit, as Smilebit was actually the bringing together of the SEGA AM6’s Team Aquila, Team Andromeda, and G9 Team (though some staff ended up moving to United Game Artists). This mix of talent lead to Smilebit being primarily tasked with the Let’s Make series of sports titles, franchises that were largely confined to Japan. 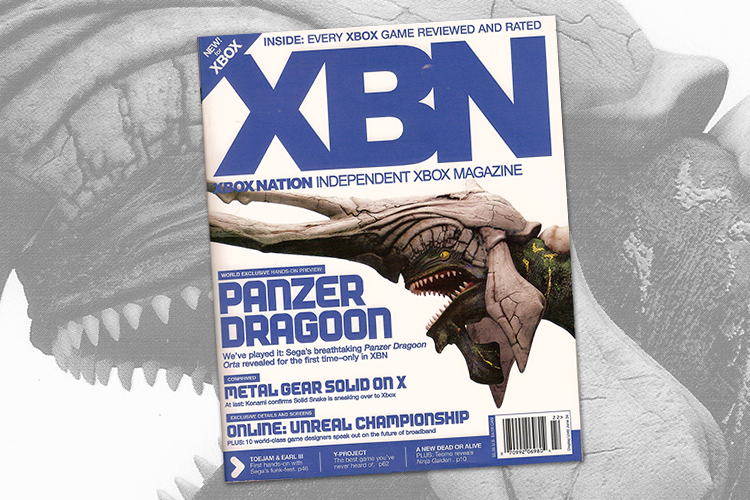 Utilizing former Team Andromeda staff, the team spearheaded the latest (and thus far last) Panzer Dragoon game. But what really made Smilebit unique were their new franchises including the Jet Set Radio games, Gunvalkyrie, and Hundred Swords. All month long we’ll be celebrating Smilebit’s eclectic mix of games, celebrating the classics, the lesser known titles, and the ones that never left Japan. Ready to look back? Let’s go! Above is the newest teaser image from the unannounced SEGA Japan game. The game is supposed to come out on the Playstation 3 and the Playstation Vita. According to the Famitsu leak this week, the game is going to be a new entry in the “Let’s make a soccer team!” franchise that SEGA has in Japan. Seems to me that this was a huge disappointment. But hey, did you know the last game in 2006 was developed by Smilebit? 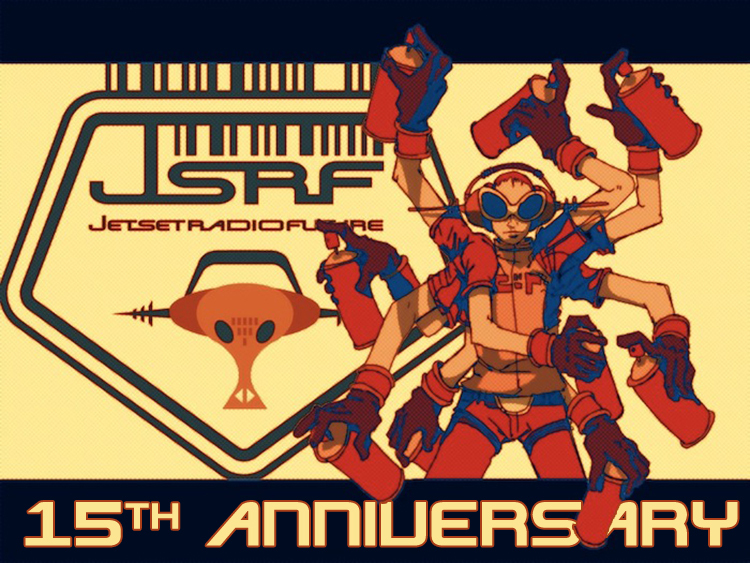 SEGA Sequel Saturdays: JET SET RADIO!! Few franchises have managed to achieve such iconic status with only two installments, but the Jet Set Radio series (Jet Grind Radio for the first one in North America,) was one that managed to do it. The series represented all that was great about Sega during the Dreamcast era: their incredible ability to take risks and deliver groundbreaking and inventive experiences that you simply couldn’t get anywhere else. What better series to get a sequel than this one? Here’s how I’d do a sequel if I were in charge. Fly like a butterfly through the break to read more and comment with your own thoughts/ideas.